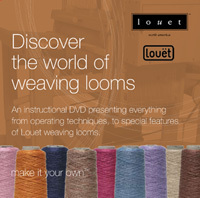 At last, a comprehensive DVD package that explains the ease of use, operating techniques, quality craftsmanship and innovative features of Louët weaving looms. 1. The Louet Warping loom and Spring information DVD – this DVD covers all aspects of the best selling Spring loom, and covers warping your loom in the most efficient way. Although this disc is made with Louet looms, the warping information in the warping DVD is easily used by weavers with other brands of loom. 2. The Louet Loom Information Guide DVD – This DVD covers all the features of the Megado, the Octado, the Delta, and the David looms. The Spring loom is covered in the warping DVD. 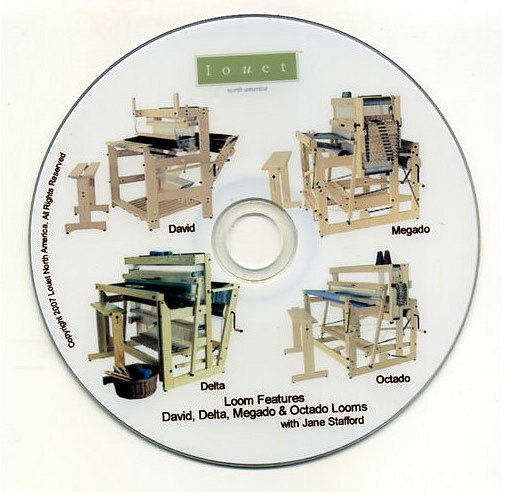 If you are thinking of purchasing a Louet loom but aren’t sure which one, this two disc set is for you. Please note that this DVD DOES NOT COVER THE JANE LOOM at this time. If you are looking for more information about the Jane, please call us at 250-537-9468 or email us at jane@janestaffordtextiles.com and we can help you personally.